We start at the LAPD in Captain Vasquez’s office, Aerostar says a millennia ago he met a girl who was going to save the world, he told her dying father to use this magic amulet to give her immortality. He told her that it only worked on females, a necessary lie, otherwise his tribe would have made him keep the amulet for himself. Star tells Vasquez that she’s done well with the extra life she was given, but he was wrong. Vasquez has been instrumental in this war, but it is not Vasquez that can save them. The future was cloudy, but now it is clear to Star. He needs her half. Her father & her daughter are both waiting for Vasquez beyond the Cosmos. The the 2 halves of the amulet are re-united as Vasquez fades away to dust. Johnny is shown playing air guitar with the Gauntlet, he says it’s going to look so sweet mounted on the wall of his dojo. Taya says yeah if he ever takes it off & reminds him that it’s THEIR dojo. Johnnny says totally their dojo then says the gauntlet will look even sweeter when it’s covered in that turd monster’s blood. He’s going to warm up & maybe test it out again, electricity crackles from the Gauntlet & in Johnny’s eyes, he asks if she’ll be there in case he need her right. Taya says she wouldn’t miss it for the Mundo. He kisses her on the cheek & gets ready to leave then stops and says if tonight he somehow ends up being sacrificed to the Gods never to be seen again just know that he loves her. He leaves and Ricky’s doll says she loves Taya too & says she’s so pretty. Taya is taken aback & says thank you & is puzzled that she didn’t even pull the doll’s string. The doll says Taya is the the perfect woman & the perfect host as it appears that the doll is possessing Taya’s body. The Agent Winter says everything is coming together just as prophesied, we see Antonio & Vamp’s Master. Winter says the ascension is complete. Antonio says all the of the Gods have taken physical form, Winter says & the LU Title is back in their control, Vamp’s Master says now they destroy all 7 Tribes of the Aztecs. 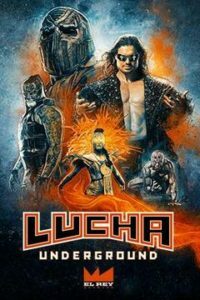 We see a shadowy figure smoking a cigar, then Jake Strong walks into the limbo with both the LU Title & The Gauntlet, Winter asks whose blodd is on Jake’s shirt, Jake says Matanza, Antonio mourns his son & clutches his bull, as the shadowy leader tells Antonio that his son was a worthy host & The Order will never forget his sacrifice, but now they must find a new host, Winter says yes my lord. The Shadow Ruler’s light comes into focus & asks if anyone else has any BAD NEWS? Stu Bennett/Bad News Barrett has been revealed as the leader of The Order. They all shake their heads no, Bennett says that he guesses that it’s time to take over the world.